On occasion, one can step into a given place and encounter a totally unexpected specimen of exquisite or unusual woodworking or carving. Such was my experience yesterday. It was the last day of a weekend trip to Maryland to visit a daughter living there. We took a jaunt over to Annapolis, and spent the day touring the old historic downtown area. We stepped into a small tea and herb shop, and this immediately caught my eye…. 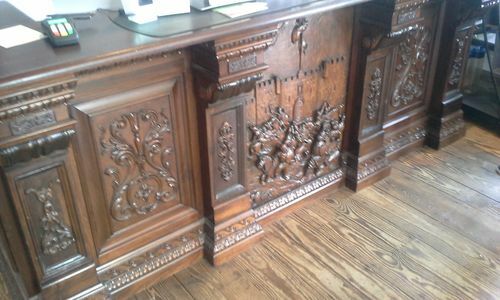 This wonderfully hand-carved piece of furniture served as the store’s customer counter. 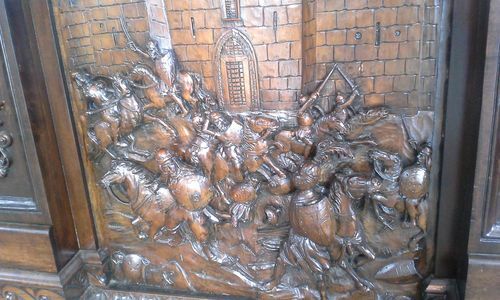 The astounding part was the center panel, a detailed relief-carved depiction of a medieval knights’ battle before a castle wall! The detail was astonishing. This picture does not fully do the piece justice, as there was bright lighting in the store that reflected off of all the polished surfaces of the carving. I asked the young man who was minding the store about the piece. He didn’t know too much about it other than it had been purchased by his father several years ago at an auction in Houston. He did know that it was well over a century old. My whole time at this store was spent kneeled in front of this marvelous piece of work, while Mrs. handsawgeek and the girls shopped for tea (for which In have no particular liking). Anyway, who does detailed hand carved battle scenes anymore? 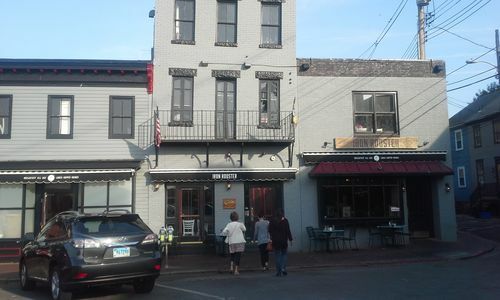 Speaking of impressive, if you are ever in Annapolis, stop in at a place called The Iron Rooster. Awesome hand made pop-tarts can be had there…. I’ll have to remember that place if I’m ever in the area. I believe the name of the shop is “Capitol Teas”. If it’s not that, it could be “The Spice & Tea Exchange”. We stopped into two different tea stores, and I don’t recall which of the two had this counter.